… Please sign the petition and share widely. We urge David Cameron and the leaders of Europe to scrap plans for Moorside. The UK Government is planning to sell a vast area of Cumbria to the same companies responsible for the Fukushima disaster, so that they can build new nuclear reactors. Please don’t risk the safety of Europe by turning Cumbria into a nuclear sacrifice zone. b) to accommodate the documented leakage of radiation from the Sellafield site into groundwater. 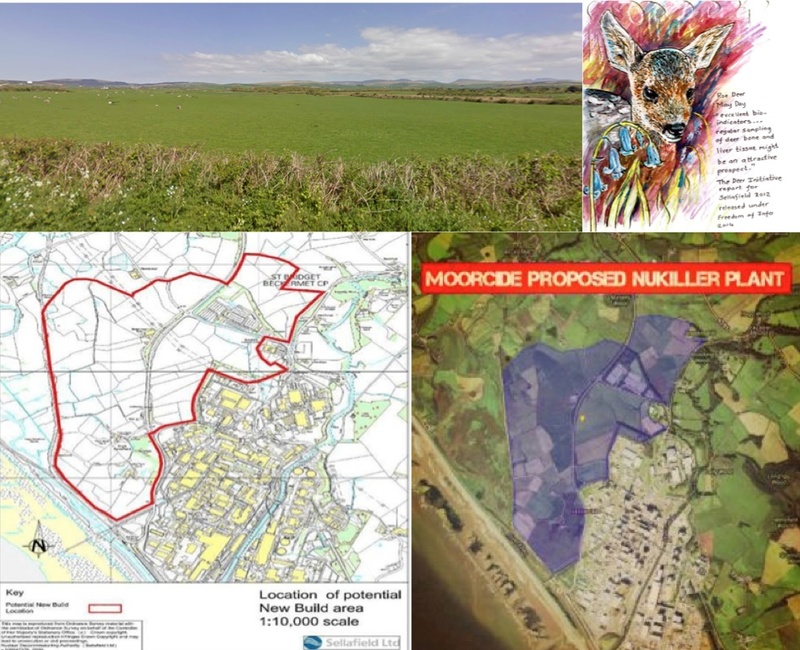 Instead of honouring a beautiful wildlife diverse landscape bought by the public purse and guaranteeing a buffer zone around Sellafield the UK government are planning to sell off a vast area. The land stretches to the villages of Beckermet, Braystones and Calder Bridge. Not only this but the companies who are being wooed to buy the land are the very same companies responsible for Fukushima. “The Moorside Project” is being promoted by NUGEN a company 60% owned by Toshiba. Toshiba’s proposed three new reactors are AP1000s. These are the next generation of the same old uranium burning technology. The difference is that these reactors burn the uranium for longer and harder. The resulting radioactive wastes are much hotter and have to be cooled for decades longer. The NDA have told Radiation Free Lakeland that the fresh water resource for cooling is “a matter for the operators.” Currently Sellafield uses over 4 million gallons of water daily to abstracted from Wastwater, the River Ehen, the River Calder and boreholes in the area. Sellafield stopped producing electricity in 2003. The elephant in the room is of course Toshiba’s track record in nuclear safety. Toshiba supplied the steam generator, architecture and reactor for Fukushima reactors numbers 3 and 5 Hitachi (merged with Toshiba) supplied the reactor, steam generator and architecture for Fukushima reactor no 4. Reclaim the Power – Radioactive Risks of Fracking and Nuclear! many thanks! The more the better. The only comments in the media are to say what a fantastic thing Moorside would be. I get the feeling the lack of media attention on this is (apart from triumphalism) is being deliberately orchestrated to try to get the plans well underway before a momentum of opposition can be built up. They can try but we will resist!!!!! Needs more publicity will put thinking cap on for alt writers and press.